Asmodeus in the Book of Tobit. Influence of Persian Beliefs on Judaism. In the Mazdian religion the chief of the dævas, or demons. Though the oldest sections of the Avesta—the Gathas—present Æshma mainly as an abstract conception, still, in passages here and there, he is represented in the guise of a personal being ranging among the evil spirits that obey Angro-mainyush. In the later portions of the Avesta the personal character connoted by the name admits of no doubt. Æshma is an enemy of Sraoscha, one of the good angels that serve Ahuramazda. Æshma's design is directed preeminently toward imbuing the hearts of men with anger and revenge. Indeed, all the evil in the world is occasioned through his agency; he fortifies men in the pursuit of evil and seeks to keep them from entering the path of righteousness. Whether Æshma, like the Jewish Asmodeus in the Book of Tobit, or the Ashmedai of the Talmud, was, as a demon, specially characterized by carnal desire can not be determined. Against such a supposition the fact may be adduced that the Mazdian religion embraces another demon, Azi, who, as expressly stated, is the demon of carnal desire. It is, however, conceivable that Æshma may have had the same part assigned to him in the popular beliefs of the Persians, although the literary sources contain nothing to support the conjecture. The etymology of the word "Æshma" affords no possibility of arriving at any such conclusion. It is true that "Æshma" is connected with the verb ish, denoting "to desire," "to lust after"; but the abstract sense, "anger," that lies in the word "Æshma" in the Gathas, would seem to point to the necessity of referring the word to the same verb "ish" in its sense of "to throw," "to put in motion" (compare Justi's note to Baudissin's article "Asmodi," in Hauck's "Realencyklopädie"). Though "Æshma" does not occur in the Avesta in conjunction with "dæva," it is probable that a fuller form, such as "Æshmo-dæus," has existed, since it is paralleled by the later Pahlavi-form "Khashm-dev" ("Khashm dev" = "Æshma dev"), written with the Aramaic "sheda," but pronounced "dev." Corresponding to this form are Ασμοδαῖος (Asmodeus) of the Book of Tobit, and in the Talmud; for the last-named word is not to be derived from "shemad." In fine, Asmodeus (Ashmedai) embodies an expression of the influence that the Persian religion or Persian popular beliefs have exercised on the Jewish—an influence that shows itself very prominently in the domain of demonology. Thus 'Ασμο, , corresponds to "Æshma," and the ending δαῖος, , to "dæva," "dev." 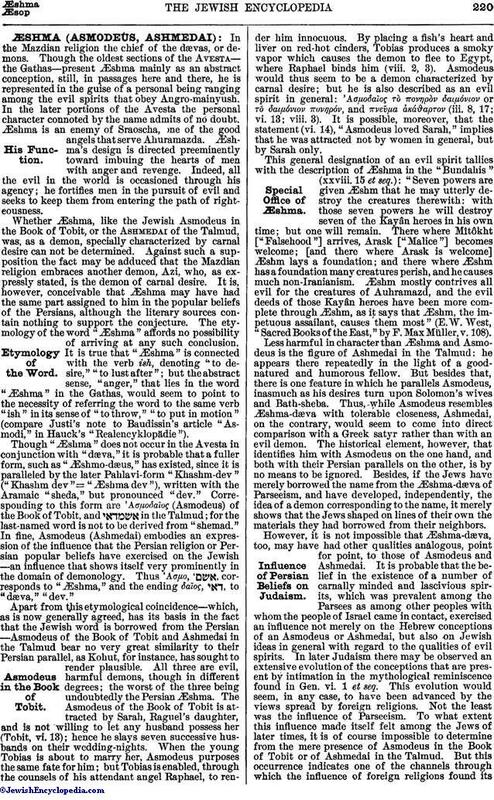 Apart from this etymological coincidence—which, as is now generally agreed, has its basis in the fact that the Jewish word is borrowed from the Persian—Asmodeus of the Book of Tobit and Ashmedai in the Talmud bear no very great similarity to their Persian parallel, as Kohut, for instance, has sought to render plausible. All three are evil, harmful demons, though in different degrees; the worst of the three being undoubtedly the Persian Æshma. The Asmodeus of the Book of Tobit is attracted by Sarah, Raguel's daughter, and is not willing to let any husband possess her (Tobit, vi. 13); hence he slays seven successive husbands on their wedding-nights. When the young Tobias is about to marry her, Asmodeus purposes the same fate for him; but Tobias is enabled, through the counsels of his attendant angel Raphael, to render him innocuous. By placing a fish's heart and liver on red-hot cinders, Tobias produces a smoky vapor which causes the demon to flee to Egypt, where Raphael binds him (viii. 2, 3). Asmodeus would thus seem to be a demon characterized by carnal desire; but he is also described as an evil spirit in general: 'Ασμοδαίος τὸ πονηρὸν δαιμόνιον or τõ δαιμόνιον πονηρόν, and πνεῦμα ἀκάϑαρτον (iii. 8, 17; vi. 13; viii. 3). It is possible, moreover, that the statement (vi. 14), "Asmodeus loved Sarah," implies that he was attracted not by women in general, but by Sarah only. This general designation of an evil spirit tallies with the description of Æshma in the "Bundahis" (xxviii. 15 et seq. ): "Seven powers are given Æshm that he may utterly destroy the creatures therewith: with those seven powers he will destroy seven of the Kayân heroes in his own time; but one will remain. There where Mîtôkht ["Falsehood"] arrives, Arask ["Malice"] becomes welcome; [and there where Arask is welcome] Æshm lays a foundation; and there where Æshm has a foundation many creatures perish, and he causes much non-Iranianism. Æshm mostly contrives all evil for the creatures of Auhramazd, and the evil deeds of those Kayân heroes have been more complete through Æshm, as it says that Æshm, the impetuous assailant, causes them most" (E. W. West, "Sacred Books of the East," by F. Max Müller, v. 108). Less harmful in character than Æshma and Asmodeus is the figure of Ashmedai in the Talmud: he appears there repeatedly in the light of a good-natured and humorous fellow. But besides that, there is one feature in which he parallels Asmodeus, inasmuch as his desires turn upon Solomon's wives and Bath-sheba. Thus, while Asmodeus resembles Æshma-dæva with tolerable closeness, Ashmedai, on the contrary, would seem to come into direct comparison with a Greek satyr rather than with an evil demon. The historical element, however, that identifies him with Asmodeus on the one hand, and both with their Persian parallels on the other, is by no means to be ignored. Besides, if the Jews have merely borrowed the name from the Æshma-dæva of Parseeism, and have developed, independently, the idea of a demon corresponding to the name, it merely shows that the Jews shaped on lines of their own the materials they had borrowed from their neighbors. However, it is not impossible that Æshma-dæva, too, may have had other qualities analogous, point for point, to those of Asmodeus and Ashmedai. 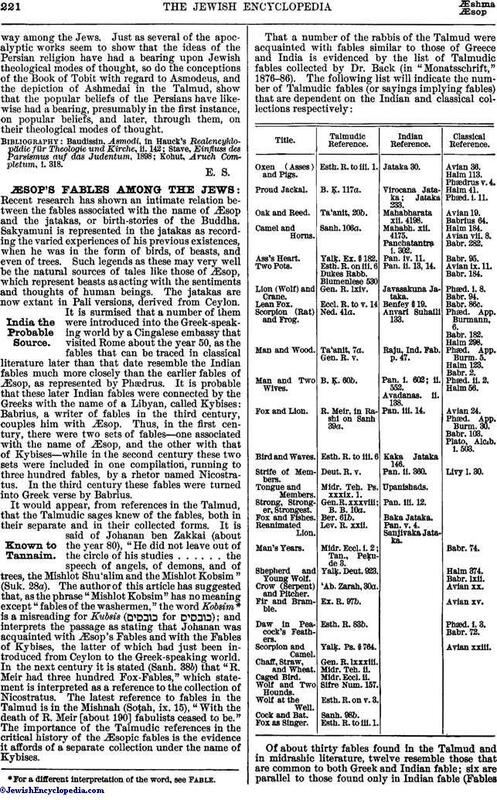 It is probable that the belief in the existence of a number of carnally minded and lascivious spirits, which was prevalent among the Parsees as among other peoples with whom the people of Israel came in contact, exercised an influence not merely on the Hebrew conceptions of an Asmodeus or Ashmedai, but also on Jewish ideas in general with regard to the qualities of evil spirits. In later Judaism there may be observed an extensive evolution of the conceptions that are present by intimation in the mythological reminiscence found in Gen. vi. 1 et seq. This evolution would seem, in any case, to have been advanced by the views spread by foreign religions. Not the least was the influence of Parseeism. To what extent this influence made itself felt among the Jews of later times, it is of course impossible to determine from the mere presence of Asmodeus in the Book of Tobit or of Ashmedai in the Talmud. But this occurrence indicates one of the channels through which the influence of foreign religions found itsway among the Jews. Just as several of the apocalyptic works seem to show that the ideas of the Persian religion have had a bearing upon Jewish theological modes of thought, so do the conceptions of the Book of Tobit with regard to Asmodeus, and the depiction of Ashmedai in the Talmud, show that the popular beliefs of the Persians have likewise had a bearing, presumably in the first instance, on popular beliefs, and later, through them, on their theological modes of thought. Kohut, Aruch Completum, i. 318.